Great putting doesnât just happen by luck. 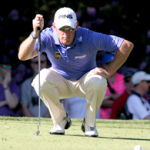 It takes precision mechanics, lots of practice and âin Lee Westwoodâs caseâsome help from Ian Baker-Finch, his neighbor at Old Palm Golf Club. In his heyday, 1991 British Open champion Baker-Finch was one of the gameâs best putters, and his sage advice has already improved Westwoodâs putting. In this yearâs British Open, where Westwood finished tied for third, his putter was red-hot. He led the tournament in âstrokes gained putting,â a new statistic kept by the PGA Tour. The statistic measures a playerâs putting performance relative to his fellow competitors in a particular tournament. Considering the fact that Westwood was previously ranked 151 in the world in âstrokes gained putting,â the improvement during the Open was dramatic. Baker-Finch has helped Westwood grip the putter lighter without altering his technique, which increases his âfeelâ on the greens. As a result, Westwood is putting with more confidence and less tension, a key to winning. Since moving to Old Palm, Westwood has already improved his scrambling and now ranks 13th on the tour in getting up and down. In 2012, he was ranked 189th. Add the drastic improvement in Westwoodâs putting, and thereâs no telling what heâll accomplish by the end of this year.